As December progresses, I’m dreading the awkward, uncomfortable moments associated with giving gifts. And, if you find giving presents to close family and friends difficult, giving gifts to teachers could sound borderline crazy. 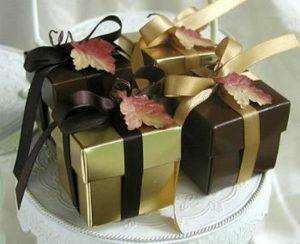 While shiny boxes of chocolate may look like an enticing gift, resist the temptation! Photo courtesy funkiefoods.com. Issues concerning how much to give, what to give and the amount of money to spend almost ruins this festive time of year. The ubiquitous gold chocolate boxes may create tension among students. How would you feel if a classmate handed your physics teacher a box of Godiva chocolates, while you sit there empty-handed and utterly awkward? As a former teacher gift-giver, I completely understand students who want to thank teachers for their help. But some see it and treat it like bribery, brown-nosing or begging for an A. There are many other, better ways to express gratitude to teachers — send a complimentary e-mail, bringing a heartfelt note or simply paying complete attention in class. Really, just don’t text. Teachers will appreciate it more than you know. Giving teachers holiday gifts is unnecessary. It does more harm than good, and causes uncomfortable situations. Judging glares know no boundaries. Remember, though it may seem like teachers only interact with students, they do have outside lives and their holiday seasons don’t depend on you.